MUCH ADO ABOUT STUFFING: A Winter's (Fish) Tale. A Look at Sustainability, the future of the oceans, and What to Eat. A Winter's (Fish) Tale. A Look at Sustainability, the future of the oceans, and What to Eat. Hi there food-blogosphere! Amanda here! It seems these days that every time I turn around I discover that I’ve been eating meats I shouldn’t be eating, scrubbing with cleaning products that pollute the water or ordering vegetables from half way around the world. (Did you know that celery has a ton of pesticides in it? Oy!) It makes it hard to eat ethically without becoming a radical tree-hugging vegan. Lucky for us meat eating, cheese loving, egg devouring “normal” folks, there are plenty of organic, sustainable and guilt-free choices that we can make to avoid supporting environmentally destructive industries. Lately, I have been exploring the 70% of our Earth’s surface covered in water. Until recently, the ocean often got neglected in discussions of environmentalism. But as it turns out, many of our fishing practices are even more harmful than the worst farming practices on land. If we are not more careful about the fisheries we support, we are at the risk of completely wiping out the fish that we love so much. (and if my kids can’t eat sushi in 25 years, I'm not going to bother feeding them at all…) So what can you do to eat more sustainably when it comes to fish? 1- Only eat seafood that comes from America. Patriotism aside, our fishing practices are generally more sustainably regulated than most other countries. 2- When it comes to SALMON, stay away from farmed. Your best bet is wild Alaskan salmon. 3- Try to eat line-caught fin fish and farmed shellfish. The staff at your grocery store’s fish counter should know where your fish came from and how it was caught. Whole foods is especially good at this! Look for this symbol when you are shopping for dinner. Or if you generally eat out, check out this Seafood Watch pocket guide or free iphone app. That will tell you exactly what fish you should avoid and better alternatives. I hope that you’ll consider thinking twice when eating fish because we only have one ocean and it’s a damn cool place. Thanks for listening and now we will continue with our normal programming… mom take it away. 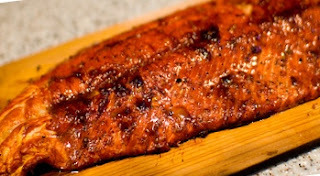 Prepared with natural red cedar, planked salmon is a slow cooking method that produces a wonderful aroma, delicate texture and rich smoky flavor. Mix maple syrup and bourbon or juice together. Set aside. Remove the planks from water and place on the grill until hot. Using tongs, carefully turn plank over and place salmon on the hot side. Place fillets on the smooth surface part of the plank, sprinkle with sea salt and black pepper. Brush maple syrup mixture over salmon. Cover grill. Cook over a medium to high flame for approximately 10 minutes or until done.